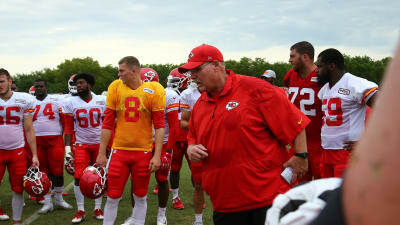 The Kansas City Chiefs finally get a chance to square-up against someone in a jersey that isn’t one of their own as they host the Houston Texans at Arrowhead Stadium Thursday night in the first preseason game for both teams. Kickoff is set for 7:30 p.m. CT and the game can be watched locally on KCTV5 (CBS). The Chiefs’ starters on both sides of the ball are set to play the first quarter with the second and third-teams to follow with a quarter a piece. “You’re looking for assignment football,” Chiefs’ coach Andy Reid explained. “You’re looking when the juices get going how you handle that. You’re in the stadium with the fans there. We’ve had a great turnout here (in St. Joseph, Missouri—home of training camp), but it’s a little different with the lights on and it’s game time.